The depth of crush for a particular vehicle involved in a crash has been shown to correspond to Equivalent Barrier Speed (EBS) of the vehicle at time of impact. By measuring crush and combining this with knowledge about how the car deforms (i.e. how stiff it is) one can estimate the speed of the vehicle at impact - which may be a crucial piece of evidence. There are two ways PhotoModeler can be used to measure crush: a) using your own camera with access to the vehicle, and b) from photographs taken by a third party where the vehicle no longer exists. Examples of both techniques are given below. Also see the SAE papers on crush measurement on the Case Studies page. In addition, if you want to watch a video describing some of these techniques, our Crushed Vehicle Mapping tutorial on the tutorials page is a good place. You may also be interested in getting exemplar models to complete your crush study. Lightpoint Data, a PhotoModeler Ambassador, provides such models. This project is an example of doing complex crush measurement from photography where there was access to the vehicle and a calibrated camera was used (courtesy of DCM Technical Services). An interesting aspect of this case is that the door of the car was removed by the emergency responders but its degree of crush was important to measure. The door was modeled independently and then merged into the photogrammetric measurement of the whole vehicle - as demonstrated by the lower image. The combined project gave the practitioner the reference frame to correctly measure the vehicle's side crush. A common use of PhotoModeler is to estimate crush from photographs that were taken with someone else's camera. Perhaps the shots were taken by the police or an insurance adjuster (that is not a PhotoModeler user). In most cases the vehicle no longer exists and the only evidence is the photographs (courtesy of DCM Technical Services). Here the Inverse Camera feature of PhotoModeler is used to rebuild the camera information of the unknown camera. You start by finding the same make and model car in undamaged condition and photographing it with your calibrated camera. You execute a standard PhotoModeler product to pick up standard points such as body panel intersections, door handles, lights, tops and bottoms of A, B and C pillars, etc. 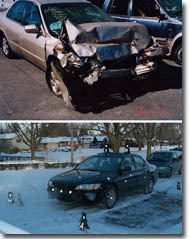 The photos from the unknown camera are combined in and the undamaged parts of the vehicle are matched to the exemplar vehicle. The damaged areas can then be modeled and measured. Crush can then be accurately determined. 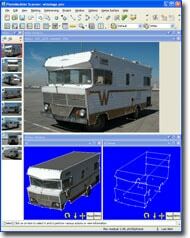 Modeling of existing and undamaged vehicles is common as well. This type of modeling is done for obtaining an exemplar model for crush comparison (as in above example), or for building models suited to animation and simulation. This example's goal is to obtain a life-like model (courtesy of DCM Technical Services). In PhotoModeler one adds surfaces to the computed 3D points and then photographic data from the same photos used for modeling can be used to 'texture' the model and improve its realism considerably. The animation was created right in PhotoModeler but the model can be exported easily in a number of different formats that popular animation programs understand.